To Cite: Fatemi M, Ghandehari F, Bahrami S, Tajedin N. In Silico and in Vitro Studies of Cytotoxic Activity of Different Peptides Derived from Human Lactoferrin Protein, J Kermanshah Univ Med Sci. 2018 ; 22(1):e69544. doi: 10.5812/jkums.69544. Background: Antimicrobial peptides belong to a large family of bioactive peptides that play an important role in human health. Lactoferrin of transferrin family is considered to be a glycoprotein. Human lactoferrin has a length of 689 - 711 amino acid polypeptides. Lactoferrin plays a role in various biological activities such as anticancer, antibacterial, antiviral, antifungal, and anti-inflammatory activity, and also as an immune system regulator. Objectives: In this study, we examined the toxic effects of human lactoferrin-derived peptides on breast cancer cells in vitro using the web server Anticp. The results obtained from the Anticp web server showed that four peptides (P39, P40, P24, P66), out of the 70 peptides, had anticancer activity, and 66 peptides had non-anticancer activity. Methods: The cytotoxicity of two peptides with high cytotoxic activity (P39, P40) and a peptide with low cytotoxic activity (P38) on breast cancer cells (MCF-7, MDA-MB-231) was examined using the MTT assay. The CC50 values of the peptides (P39, P40) were 100 μg/mL for MCF-7 cells and 950 and 1000 μg/mL for MDA-MB-231 cells, respectively. Results: The results showed that the activity of the cytotoxic peptides P39 and P40 was significantly higher than that of P38 on the breast cancer cells (P ≤ 0.001). Cancer cells treated with CC50 concentrations showed a percentage of the cells detached from the flask and surrounding cells as well as shrinkage and deformation on the surface. Also, apoptotic seeds inside the cells were observed with 40X magnification. Antimicrobial peptides belong to a large family of bioactive peptides which play an important role in human health. These peptides are considered as emerging new therapeutic agents due to many factors such as their short length, short half-life, rapid action on bacteria, and low toxicity (1). Research findings show that some antimicrobial peptides exhibit a large number of cytotoxic activities against cancer cells but have no toxic effect on normal cells. Lactoferrin, a protein belonging to transferrin family weighing 80 KD with 703 amino acids, has multiple physiological activities like anticancer, antibacterial, antifungal, and anti-inflammatory activity (2). Although the mechanisms involved in the anticancer activities of lactoferrin are not yet understood, there is no doubt regarding its anticancer activity. Therefore, we studied the cytotoxic activities of the peptides derived from human lactoferrin on normal and cancer cells. Several computational methods are available for predicting the toxicity of anticancer peptides. These methods facilitate the designing of therapeutic peptides with high toxicity against cancer cell lines. They are usually based on machine learning methods (3). Machine learning method can predict anticancer peptides using three different algorithms including artificial neural network, quantitative matrices, and support vector machine (SVM). SVM model is a strong algorithm developed based on the amino acid composition and binary profile features (4, 5). Anticp is a website which determines the toxicity of anticancer peptides through SVM method. In the present study, we used the SVM algorithm to predict peptides with high and low toxicity (6). The cytotoxic activity of two peptides with high toxicity value and one with low toxicity value was studied against MCF-7 and MDA-MB-231 breast cancer cell lines and human embryonic kidney normal cell line (HEK293). First, amino acid sequences of lactoferrin protein were retrieved from NCBI web page (http: //www.ncbi.nlm. gov/protein). The lactoferrin protein sequence was divided into 70 overlapping peptides; each peptide consisted of 20 amino acids in length. The anticancer activity of all the lactoferrin peptides derived was predicted using the Anticp web server computer program (crdd.osdd.net/raghava/Anticp). The SVM methods were applied to predict and classify the anticancer and non-anticancer peptides. Two peptides with a high score and one with a low score were purchased, as synthetic peptides, from China Shine gene company, with a purity of > 75% and used without further purification. The peptides were stored at -4°C until they were used. MCF-7 and MDA-MB-231 breast cancer and HEK cell lines were purchased from national cell bank of Pasture institute, Tehran, Iran. The cell lines were grown in Dulbecco’s Modified eagle medium supplemented with 10% heat-inactivated fetal bovine serum (FBS), 100 U/mL penicillin, 100 μg/mL streptomycin, and 5Mm L-glutamine. The cell lines were cultured at 37°C with 5% CO2 in a humidified atmosphere. All reagents and cell culture media were purchased from Gibco Company, Germany. The cytotoxicity of the peptides P39 and P40 with high and P38 with low cytotoxic activity, isolated from lactoferrin protein, was examined using the MTT assay (7). The peptides were initially dissolved in deionized water and then diluted to prepare working concentrations of 10, 100, and 1000 μg/mL. The cells were grown in 96-well plates at a density of 5 × 104 cells per well. After incubation for 4 hours, the cells were treated with different concentrations of the samples and incubated for 72 hours. Then, 25 μL of MTT solution (5 mg/mL) was added to each well, and the plates were reincubated for 4 hours. Finally, the medium was removed, and 100 μL of DMSO was added to solubilize the formazan crystals. The amount of formazan crystal was determined by measuring the absorbance at 492 nm using a microplate spectrophotometer (Awareness Technology Inc Stat fax 2100). All assays were carried out in triplicate. The data from the three independent experiments have been presented as mean ± SD. The CC50 value was calculated by Microsoft Excel 2013. One-way ANOVA was used, followed by a post-hoc test (DUNCAN) and repeated measure ANOVA. P value ≤ 0.05 was considered as the measure of statistical significance between samples. The results showed that P24, P39, P40, and P66 peptides had scores more than 0.9 (90%) and were represented as anticancer peptides. Other peptides with a score less than 0.9 were determined as non-anticancer peptides. P39 and P40 peptides with higher scores and P38 with a lower score were selected as positive (cytotoxic) and negative (non-cytotoxic) data set respectively, for the in vitro experiments (Table 1). Different concentrations of P39 and P40 (10, 100, and 1000 μg/mL) were tested for cytotoxicity against MCF-7, MDA-MB-231, and HEK cell lines (Figure 1). The results indicated that both cytotoxic peptides, P39 and P40, inhibited the viability of MCF-7 and MDA-MB-231 cell lines in a dose-dependent manner. The CC50 values of P39 and 40 peptides were 100 μg/mL for MCF-7 cells and 950 and 1000 μg/mL for MDA-MB-231 cells, respectively. The results of one-way ANOVA and repeated measure ANOVA indicated that the cytotoxic activity of P39 and P40 against MCF7 and MDA-MB-231 cells was significantly more than that of P38 (P ≤ 0.001). P39 and P40 peptides had no toxic effect on the normal cells, and no significant difference was found between the P38 peptide and P39 and P40 peptides. Figure 1. 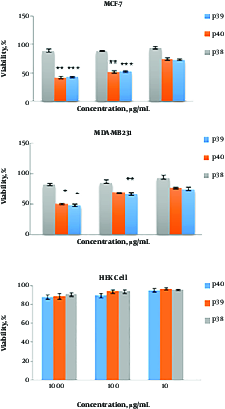 Cytotoxic activity of P39, P40, and P38 peptides against MDA-MB-231, MCF-7, and HEK cell lines. Cells were treated with different concentrations of the peptides for 72 hr. The effect was measured by MTT cell viability assay. The results are presented as means ± SD of three independent experiments. ***P ≤ 0.001, **P ≤ 0.01, *P ≤ 0.05 compared with non-anticancer peptide P38. The cancer cells treated with CC50 concentrations showed a percentage of the cells detached from the flask and surrounding cells as well as shrinkage and deformation on the surface. Also, apoptotic seeds inside cells were observed with 40X magnification. In this study, the cytotoxic activity of different peptides derived from the protein lactoferrin was evaluated. Peptides P24, P39, P40, and P66 were identified as anticancer peptides through the Anticp website. According to the findings of this study, these peptides are located in the position 230 to 670 of the protein and are most probably responsible for the anticancer activities of lactoferrin. Two peptides, P39 and P40, of the four peptides were tested on breast cancer cell lines. The findings showed that these two peptides have high cytotoxic activity against MCF-7 and MDA-MB-231 cells even in in vitro condition. Recent studies have shown that antimicrobial peptides with anticancer activities can be good candidates for anticancer drugs. The anticancer effects of these peptides may, in general, occur either by membranolytic or non-membranolytic mechanisms. The basic mechanism of action of each membranolytic peptide is dependent on these characteristics as well as on the target membrane features, which in turn change the selectivity and toxicity of the peptides (8). Peptides like defensins, BMAP-27, and BMAP-28 show high cytotoxic activity against leukemia cell lines and breast carcinoma cells (9). The proliferation and viability of bladder cancer cells were decreased with cecropin A and B (10). Moreover, studies have shown that MagaininII has a selective anticancer potential and even displays obvious antiproliferative and cytotoxic activity on high-grade as compared with low-grade cancer cell line (11). Reports show that these peptides can destroy cancer cells through electrostatic interactions between the cell membrane component and the peptide; moreover, peptides could stimulate apoptosis in cancer cells via mitochondrial membrane interference of subsequent uptake of peptides into the cytoplasm (12). The results of the current study demonstrated that the cytotoxic activity of these peptides against MCF-7 and MDA-MB-231 cells was significantly more than that of the HEK normal cells (P ≤ 0.001). This difference may be attributed to the different compositions of the cancer cell membranes. Previous studies have shown that factors like the difference in the cellular membrane composition, fluidity, and microvilli number between the normal and cancer cells determines the ability of some peptides in killing the cancer cells without any toxicity on the normal cells. A previous study done on the protein VSVG has shown that the peptides P27 and P28, derived from this protein, have high cytotoxic activity against breast cancer cells in in vitro condition. Moreover, the morphological changes and ladder pattern of DNA shows that these peptides can induce apoptosis (13). Studies done on other anticancer peptides like BMAP-28 derived from cathelicidin show that these peptides can cause cellular death through apoptosis, making outlets in the mitochondria membrane and releasing cytochrome C (14). The anticancer activities of lactoferrin and lactoferrin nanoliposomes were demonstrated in Caco-2 cells using apoptosis induction (AO/EB staining), mitochondrial function (MTT assay), and count kit-8 (CCK-8) assays (15). Studies on lactoferricin B show that this peptide causes cellular death through apoptosis via the mitochondrial pathway (16). The morphological changes seen as a result of the healing of cancer cells by cytotoxic peptides of lactoferrin protein (P39-P40) determines the apoptotic index. Since chemotherapy drugs play an important role in apoptosis induction, conducting more research on the role of such peptides in inducing apoptosis and their cytotoxic activity may perhaps lead to their introduction as cytotoxic agents. The results indicated that P39 and P40 peptides could be appropriate candidates for in vivo testing as cytotoxic agents. This research was supported by the department of biology, branch Falavarjan, Islamic Azad University, Isfahan, Iran. 1. Hancock RE, Diamond G. The role of cationic antimicrobial peptides in innate host defences. Trends Microbiol. 2000;8(9):402-10. [PubMed: 10989307]. 2. Rodrigues L, Teixeira J, Schmitt F, Paulsson M, Mansson HL. Lactoferrin and cancer disease prevention. Crit Rev Food Sci Nutr. 2009;49(3):203-17. doi: 10.1080/10408390701856157. [PubMed: 19093266]. 3. Sharma A, Kapoor P, Gautam A, Chaudhary K, Kumar R, Chauhan JS, et al. Computational approach for designing tumor homing peptides. Sci Rep. 2013;3:1607. doi: 10.1038/srep01607. [PubMed: 23558316]. [PubMed Central: PMC3617442]. 4. Ory DS, Neugeboren BA, Mulligan RC. A stable human-derived packaging cell line for production of high titer retrovirus/vesicular stomatitis virus G pseudotypes. Proc Natl Acad Sci U S A. 1996;93(21):11400-6. [PubMed: 8876147]. [PubMed Central: PMC38069]. 5. Qiao J, Moreno J, Sanchez-Perez L, Kottke T, Thompson J, Caruso M, et al. VSV-G pseudotyped, MuLV-based, semi-replication-competent retrovirus for cancer treatment. Gene Ther. 2006;13(20):1457. 6. Tyagi A, Kapoor P, Kumar R, Chaudhary K, Gautam A, Raghava GP. In silico models for designing and discovering novel anticancer peptides. Sci Rep. 2013;3:2984. doi: 10.1038/srep02984. [PubMed: 24136089]. 7. van Meerloo J, Kaspers GJ, Cloos J. Cell sensitivity assays: the MTT assay. Methods Mol Biol. 2011;731:237-45. doi: 10.1007/978-1-61779-080-5_20. [PubMed: 21516412]. 8. Gaspar D, Veiga AS, Castanho MA. From antimicrobial to anticancer peptides. A review. Front Microbiol. 2013;4:294. doi: 10.3389/fmicb.2013.00294. [PubMed: 24101917]. [PubMed Central: PMC3787199]. 9. Risso A, Braidot E, Sordano MC, Vianello A, Macri F, Skerlavaj B, et al. BMAP-28, an antibiotic peptide of innate immunity, induces cell death through opening of the mitochondrial permeability transition pore. Mol Cell Biol. 2002;22(6):1926-35. [PubMed: 11865069]. [PubMed Central: PMC135593]. 10. Suttmann H, Retz M, Paulsen F, Harder J, Zwergel U, Kamradt J, et al. Antimicrobial peptides of the Cecropin-family show potent antitumor activity against bladder cancer cells. BMC Urol. 2008;8:5. doi: 10.1186/1471-2490-8-5. [PubMed: 18315881]. [PubMed Central: PMC2276511]. 11. Lehmann J, Retz M, Sidhu SS, Suttmann H, Sell M, Paulsen F, et al. Antitumor activity of the antimicrobial peptide magainin II against bladder cancer cell lines. Eur Urol. 2006;50(1):141-7. doi: 10.1016/j.eururo.2005.12.043. [PubMed: 16476519]. 12. Hoskin DW, Ramamoorthy A. Studies on anticancer activities of antimicrobial peptides. Biochim Biophys Acta. 2008;1778(2):357-75. doi: 10.1016/j.bbamem.2007.11.008. [PubMed: 18078805]. [PubMed Central: PMC2238813]. 13. Ghandehari F, Behbahani M, Pourazar A, Noormohammadi Z. In silico and in vitro studies of cytotoxic activity of different peptides derived from vesicular stomatitis virus G protein. Iran J Basic Med Sci. 2015;18(1):47-52. [PubMed: 25810875]. [PubMed Central: PMC4366742]. 14. Zachowski A. Phospholipids in animal eukaryotic membranes: transverse asymmetry and movement. Biochem J. 1993;294 ( Pt 1):1-14. [PubMed: 8363559]. [PubMed Central: PMC1134557]. 15. Ma J, Guan R, Shen H, Lu F, Xiao C, Liu M, et al. Comparison of anticancer activity between lactoferrin nanoliposome and lactoferrin in Caco-2 cells in vitro. Food Chem Toxicol. 2013;59:72-7. doi: 10.1016/j.fct.2013.05.038. [PubMed: 23743119]. 16. Zhang Y, Lima CF, Rodrigues LR. Anticancer effects of lactoferrin: underlying mechanisms and future trends in cancer therapy. Nutr Rev. 2014;72(12):763-73. doi: 10.1111/nure.12155. [PubMed: 25406879].